Did Eureka City Schools renege on a deal to sell Jefferson Elementary to the City, or did the City drop the ball? 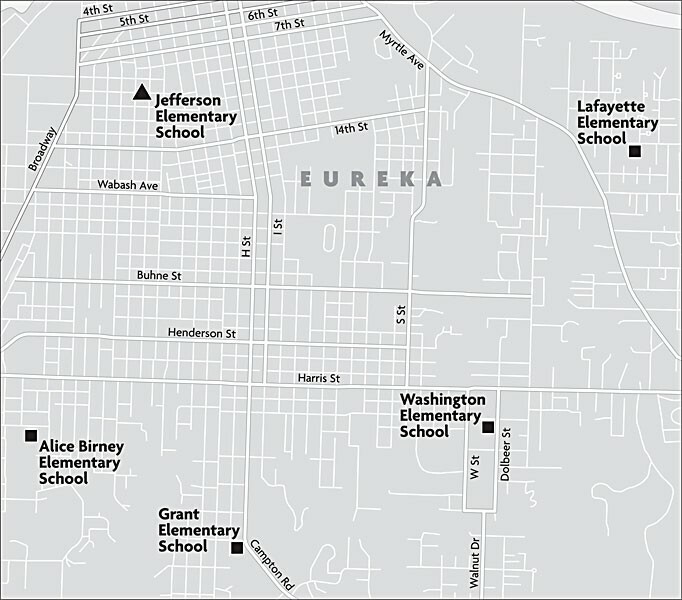 Eureka City Schools' closure of Jefferson Elementary in 2005 left the city without an elementary school in the downtown area. Map by Miles Eggleston. Everyone with the City of Eureka believed it was a done deal. Jefferson Elementary School, which has lain empty and deteriorating in the West Side since closing in 2005, would be sold to the City for $600,000 in redevelopment funds -- half in cash and half in installments over the next five years, per a request from the owner, Eureka City Schools. It was a deal that staff, council members and citizens had been working toward for more than a year and a half. The City had spent $15,000 on a feasibility study to examine possible uses for the site, and they'd assembled a list of 18 interested tenants including North Coast Children's Services -- currently located across the street -- and a couple of charter schools. Staff was pursuing a state grant to turn the cement playground into a neighborhood park. The Jefferson School Committee, a group of concerned neighbors, wanted to see kids out there again. And the City had a deal with ECS to make it all possible. On Feb. 1, City Manager David Tyson found out that ECS had accepted another offer -- from College of the Redwoods, for $50,000 less than the City was offering, Tyson said. CR wants to turn the campus into a vocational training and educational facility to replace its existing Downtown Eureka site and provide space for new certificate and degree programs, night classes and education for seniors. ECS Superintendent Gregg Haulk insists this new deal was all above board, and that the City has only itself to blame. "Our understanding is that we were in negotiations [with the City]," Haulk told the Journal on Tuesday. The two sides had agreed to terms of a sale at their last meeting, sometime in November or early December, but the City never followed through with a formal contract, he said. "We left that meeting expecting something would be coming to us rather quickly." Instead, City officials were incommunicado for months, Haulk explained. When another viable offer came along -- and a better one, in the district's eyes -- they took it, fair and square. Eureka officials see things differently. "They can say what they want now, but we had a deal," Councilman Larry Glass told the Journal on Monday. Tyson agreed. "We sent them a letter in June [saying] that we had interest and gave them a formal proposal in the first part of August," Tyson said. "In October they got back to us and said they accepted our offer." Again, Haulk insists ECS merely accepted terms, not an official offer. But City staff believed the process had moved into a leisurely due diligence phase. "Because of the holidays and various things on our plate, and I presume their plate, there wasn't any reason to push it forward," Tyson said. In early January, the City finally submitted a formal intent-to-purchase letter, but by then it was too late. City officials aren't the only ones unhappy with this turn of events: The Jefferson School Committee doesn't want CR in their neighborhood. Nothing against the college, they say, but kids on the West Side, who now get bused miles across town every day, need a place to play, and the neighbors don't want the traffic, noise and late-night activity of a college campus. (Under CR's proposal, the playground would be turned into a parking lot with just a tiny "pocket park.") "What's missing in that neighborhood are opportunities for kids and families," said committee member Heidi Benzonelli. "Right now [kids] go down and they break into the playground. They crawl through the fence. They were playing soccer on the pavement yesterday." Tyson said the City has been working for years to convince more families to move into the West Side, but the lack of elementary schools makes that difficult. When ECS closed the school in 2005 they cited declining district-wide enrollment as well as Jefferson's small size and expensive renovation requirements (the multi-level campus is not compliant with the Americans with Disabilities Act, for example). CR, meanwhile, is experiencing record enrollment increases, including a 100 percent jump in its "101 Corridor" instruction sites -- Eureka Downtown, Arcata and McKinleyville -- over the past year. The Jefferson School Committee invited CR officials, including President Jeff Marsee, to a meeting at Eureka City Hall last Monday where members voiced their objections to the college's plans. CR spokesman Paul DeMark said this week that they were a bit surprised by the community resistance, especially considering the amount of money CR is willing to pour into the facility. The purchase would be financed with Measure Q funds (a controversial use of the 2004 voter-approved bond monies, though CR's lawyers say it's legit), and Marsee has promised to invest more than $1 million to renovate the campus. "We are trying to provide something that we believe is going to be a tremendous asset for the West Side of Eureka, Eureka in general and the surrounding communities," DeMark said. But Tyson said that's not the problem. "I think to a person everybody supports CR and the notion of having a campus in the city. But for the neighbors it's really about location." Glass phrased it more bluntly. The prospect of a CR site at Jefferson School, he said, "reminds me of an elephant in a birdbath." The deal between ECS and CR is not yet final. A 90-day review period, during which CR officials will mull the pros and cons of the purchase, expires at the end of March. Haulk, for one, said he's not dissuaded by the objections of the City or the Jefferson School Committee. Plenty of other neighbors are "absolutely thrilled" by CR's offer, he said. And unlike the City's vague proposal, which would rely on a cobbled-together group of tenants to supply operational expenses, CR has the purchase and renovation money up-front. ECS Board President Judy Anderson also expressed support for CR's offer. If their stance holds, the decision, and thus the fate of Jefferson School, is entirely up to the CR brass.